A Pius Geek: TONIGHT ON THE CATHOLIC GEEK: LIVE WITH ANN MARGARET LEWIS. TONIGHT ON THE CATHOLIC GEEK: LIVE WITH ANN MARGARET LEWIS. If you don't know who AML is ... you must be new here. 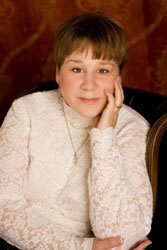 Ann is the author of Murder in the Vatican: The Church Mysters of Sherlock Holmes, as well as The Watson Chronicles. She's worked for DC comics, written books on Star Wars, a registered soprano, and generally awesome. She is also one of the founding members of the Catholic Writer's Guild. On Sunday's show, we will discuss the various flavors of Sherlock on television, DC Comics (their TV shows, and their upcoming films), and the Catholic Writer's Guild Conference Live!